The difference between winning and losing in today's games isn't measured in meters or seconds, but micrometers and milliseconds. When the stakes are at their highest, a single click can be the difference between going home with $5k or with $500k. 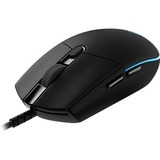 That's why Logitech G created the Pro Gaming Mouse. Its lightweight body and optical gaming sensor are engineered for the unprecedented speed and precision aiming needed at the highest level of esport competition. Customizable with up to 16.8 million colors. Perfect for sporting your team or your favorite team's color, personalizing your setup, or synchronizing with other G products. In competition, this lighting also acts as a power indicator so you know your equipment is plugged in.